This small, graceful, forest magpie has a black cap that can be fluffed up into a crest. The bird raises this crest for display purposes. It is agile on the ground as well as in flight. Aided by fluttering wings, it can hop up tree trunks and other vertical surfaces and even cling upside down beneath branches. 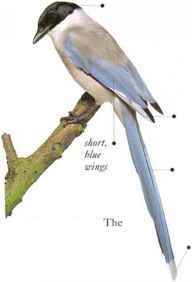 Its long tail gives it maneuverability in the air, enabling it to weave and dodge between the branches of trees. In the open, it usually flics low anil level, sometimes swooping, with 011c bird following another from tree-to tree. Azure-winged Magpies arc sociable, living in small parties that forage together for insects and other small invertebrates, small fruits, and some seeds. 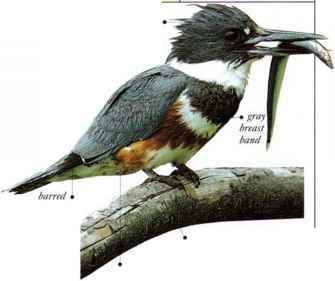 Food items may be hidden and later retrieved, pairs in each group nest in close proximity, often in adjacent trees. • NEST A cup nest made of twigs, with a lining of roots, plant fibers, hair, and wool, situated in a tree or bush. • DlSTRIBl 'TION Two separate populations: one- in Portugal and S. Spain; the other in E. Asia in Mongolia. China. Korea, and Japan.